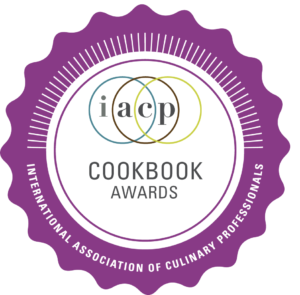 The IACP Cookbook Awards honor the authors, publishers, and other contributors behind the best cookbooks published each year. Being acknowledged as a finalist or winner has become a coveted mark of distinction, in part because of the program’s growing list of illustrious honorees, who, over the years, have included Mark Bittman, Julia Child, Dorie Greenspan, Thomas Keller, J. Kenji López-Alt, and Yotam Ottolenghi, among others. Our program requires recipe testing in all relevant awards categories. Last year, the program received over 500 exceptional submissions. Awards are given in 16 categories, and one cookbook will be selected by our judges as the IACP Cookbook of the Year. Entries into multiple categories are allowed to provide maximum submission flexibility. Three optional awards, the Jane Grigson, Design, and Judge’s Choice Awards, may be presented should qualified entrants emerge. A People’s Choice Award is also determined by popular vote from among the finalists in each category. For more information about Cookbook Awards categories, past recipients, judging procedures, and other guidelines, or to submit your book, please review the links in the quick links box on the right. The Cookbook Awards are open to both IACP members and non-members. Books may be entered into any number of 16 Cookbook Awards categories below. Cookbooks that focus on ethnic, cultural or regional cooking in the United States. This category requires recipe testing/evaluation by the judges. Books entered in this category must contain recipes. Cookbooks that focus on breads, pastries, doughs, or desserts. This category requires recipe testing/evaluation by the judges. Books entered in this category must contain recipes. Cookbooks by professional chefs and cookbooks that focus on the cuisine of specific chefs or restaurants and are designed with the home cook in mind. This category requires recipe testing/evaluation by the judges. Books entered in this category must contain recipes. Cookbooks that focus on young home cooks and/or family cooking. These everyday or special occasion cookbooks should inspire children and young people to prepare new dishes, or present ways to teach basic nutrition concepts, or provide fundamental knowledge of the origin of food. This category requires recipe testing/evaluation by the judges. Books entered in this category must contain recipes. Cookbooks comprised of recipes previously published in another format or compiled by a staff of writers or editors. This includes books produced by corporations, community organizations or food and beverage related magazines or newspapers. This category requires recipe testing/evaluation by the judges. Books entered in this category must contain recipes. Books that focus on culinary travel. These can be guidebooks, travelogues, or other types of books that illuminate the culture of a place through an exploration of its food, anywhere in the world. These books may include recipes, however, this category does not require recipe testing/evaluation by the judges. Cookbooks that focus on the impact of food choices on personal health and the health of the planet. This category encompasses issues related to farming and fishing, buying and selling, abundance and scarcity, the joy of plenty and the fear of hunger and deprivation. Books included may be related to science and technology, food processing, marketing and publicity, ethical and cultural issues related to food, and the influence of law and politics on our daily diet. These books may include recipes, however, this category does not require recipe testing/evaluation by the judges. Awarded to a photographer, stylist and author for photography and styling in a cookbook that clearly, accurately and artistically reflects recipes, cooking techniques and/or cooking equipment, enhances the text with stimulating visual images and reflects the overall tone of the book through the photos. These books may include recipes, however this category does not require recipe testing/evaluation by the judges. Multiple-subject cookbooks, including all-purpose cookbooks, personal recipe collections and books that reach a general audience. This category requires recipe testing/evaluation by the judges. Books entered in this category must contain recipes. Cookbooks and diet books that focus on healthful eating, nutrition, dietary concerns and special or restrictive diets. This category requires recipe testing/evaluation by the judges. Books entered in this category must contain recipes. Cookbooks that focus on recipes of a particular geographical region or cultural identity other than the United States. This category requires recipe testing/evaluation by the judges. Books entered in this category must contain recipes. Fiction or nonfiction books about food and/or beverages, food and/or beverage-related travel, culinary history, or memoirs or biographies of food people in which the work is distinguished by the quality of its prose. Quality of writing is the defining factor. These books may include recipes, however, this category does not require recipe testing/evaluation by the judges. Reference and/or technical books on culinary terms, techniques or ingredients, alcoholic or other beverages, or general culinary information. This includes books such as dictionaries, encyclopedias, glossaries, atlases or culinary instruction manuals. These books may include recipes, however, this category does not require recipe testing/evaluation by the judges. Cookbooks that focus on specific food ingredients, cooking methods, techniques or appliances that reach a general audience. This category may also include non-alcoholic beverage writings. This category requires recipe testing/evaluation by the judges. Books entered in this category must contain recipes. The Design Award is given to a book that exemplifies special qualities of visual design, including layout and typography, whether or not the book includes photographs, drawings, or paintings. The Design Award is given to the publisher. All books entered in the Cookbook Awards, not just category winners, are eligible for these optional awards. No additional entry form or fee is required for consideration. The Jane Grigson Award is given to a book that exemplifies Jane Grigson’s extraordinary ability to put food in a wider cultural context, using diligent but not pedantic scholarship. Jane Grigson, a cookbook author from the United Kingdom, was a prose stylist of high degree. The book should exhibit distinguished scholarship in the quality of its research and presentation. The Judge's Choice Award is presented if the Cookbook Awards Executive Committee wishes to recognize an outstanding entry that has not otherwise been recognized as a finalist or winner. Books on the history, evaluation or production of alcoholic beverages, the serving or pairing of alcoholic beverages with food, or mixology. This category is not limited to wine, beer and spirits; any book on alcoholic drinks are eligible. These books may include recipes, however, this category does not require recipe testing/evaluation by the judges.